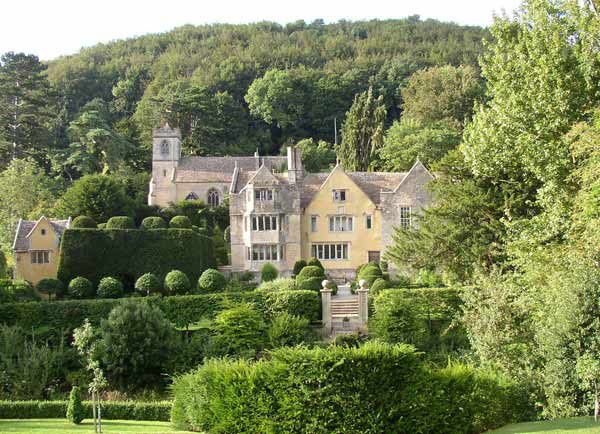 OWLPEN MANOR stands in its own hidden valley under the edge of the Cotswold hills, its domain of pasture and meadow land enclosed by an amphitheatre of steeply-rising hills crowned with beech woods. Here the pearl-grey manor house with its enormous yews and attendant outbuildings form a remarkable group, nestling under the lee of the hillside. The Tudor manor house, built and rebuilt organically between about 1450 and 1720, its early formal garden and cluster of traditional buildings, possess a charm, presence and perfection of form and scale which have long been admired as one of the treasures of Cotswold scenery. The centre of the south front by F.M. 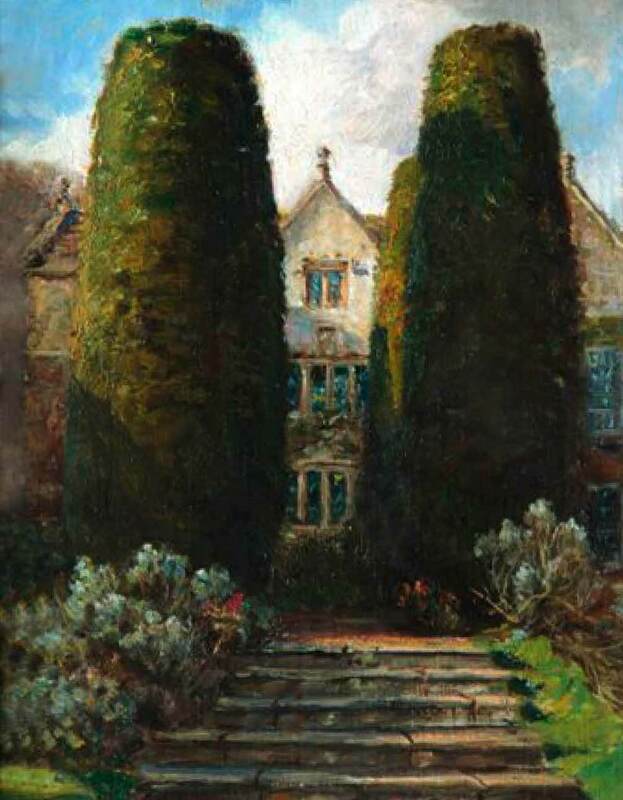 Bennett, 1922, framed by the magnificent yew topiary. Surviving documents suggest there has been a house on the site of the present manor since early medieval times, attracted by the springs which rise under the house. The church is probably built on medieval foundations of the same date as the house. 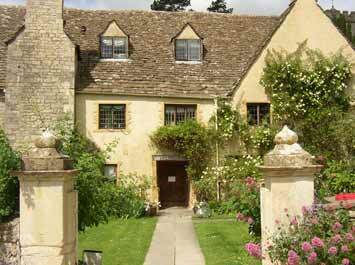 The existing Cotswold stone manor house is 'sub-medieval', having grown by accretions from east to west over a period of some three centuries, from the fifteenth century to 1616, with minor alterations of the early eighteenth century. Since then, nothing has been done -- or, more remarkably, undone -- except for the sensitive repairs of Norman Jewson in 1926. The east service range, set at the lower end of the hall, has arch-braced (and previously wind-braced) trusses which are dated by dendrochronology to 1539. The roof retains reused timbers, probably from the medieval house, dated about 1294. The early manor house would have consisted of the usual central hall, with a cross-wing at either end, a plan retained and developed in the complicated sequence of later rebuilding and adaptation. The present hall/great chamber range in the centre was rebuilt in at least three phases in the sixteenth century. There is evidence that it replaces, or is a rebuilding of, an earlier hall, which would have been a single-story structure open to the roof, with an open hearth. The hall has a screens passage entry at the lower end and a compartmental ceiling dated 1522-5. An earlier roof of 1541 was rebuilt in 1584-6. The most recent part of the fabric is the west wing, an extension at the upper end of the hall, the only part of the house with some pretensions to polite 'architecture'. Again, this is probably a remodelling of the earlier solar wing, with its storyed bay window, chimney stack with freestone diagonal-clustered chimneys, and two gables to the west front, dated outside "TD anno 1616". Thomas Daunt's Oak Parlour represents the lord's parlour at the upper end of the hall, with the chamber over at first floor level, confirming the tenacity and continuity of medieval arrangements in the Renaissance period at the manorial level. The early seventeenth-century manor is of two full stories, with attics over, the characteristic gables to the attics giving them full story height. The manor by then formed a conventional, but squat, H-plan hall house, with cross-wings of unequal length at either end of the hall, a passage at first-floor level connecting them, and twin newel stairs. These two western bays, containing the Oak Parlour and Hall, seem to be part of a unified extension to the medieval plan, with the hearths and stacks integral and a sixteenth-century door and frame from the Great Chamber opening to the west, suggesting a previous structure on this site. At any rate, the early seventeenth-century additions make for a more symmetrical and formal disposition of the rooms, with the twin staircases and more ordered fenestration, notably to the west, revealing increasing classical influence. The (earlier) rear elevations are rendered, with random timber windows in a medieval arrangement; while the front is ashlar faced, except for the central section, with stone dressings of the Cotswold vernacular: recessed hollow-moulded mullioned windows, hood-moulds, string courses, and parapet tablings, kneelers and finials. The kitchen wing (NE) probably dates to the early 17th-century period, or shortly after. Archaeological evidence suggests it incorporates elements of earlier detached outbuildings, set in a planned relationship to the main domestic well (north of the present kitchen). The penthouse (or 'pentice') extension would have been added to the north of the hall (at the end of the screens passage) to give access to the kitchen wing. The final phase is one of early eighteenth-century improvements, with an emphasis on increasing classicism and symmetry and the insertion of sash windows, hearths, panelling and partitions in a general remodelling, restricted to the two main floors of the (early) east wing. All these works, by Thomas Daunt V, are well documented from 1719 onwards. The house was abandoned in the early nineteenth century, when a new mansion was built a mile away, at the eastern end of the estate. By 1922 there was concern for its future and it was suggested it should be taken over by the National Turst to save it for the nation. Norman Jewson was able to acquire the house at auction in 1925, and set about putting the house into repair. His Arts and Crafts repairs of 1925-6 are understated, architecturally an epilogue or afterword, repairing and conserving what was already there. Again there were some small functional improvements (such as to the domestic offices and two staircases) to make the house habitable for modern conditions. The work of Norman Jewson is described on a separate web page under the "Arts and Crafts" tab. In 1963-5 the domestic offices were demolished and further minor improvements were made, but essentially the manor is a survival from the early seventeenth century which has been remarkably little altered. The house as it stands is not unified in the details of its plan or structure, for it is the creation of nearly three centuries of organic growth and adaptation to the needs and fashions of successive generations, illustrating the evolution of English domestic architecture and history, washed by the passing waves, in Ruskin's phrase, of humanity, of erosion and replacement. The architectural historian David Verey commented that it is one of those houses which has "been altered so much at so many different periods that is difficult to say that this is Elizabethan more than anything else". 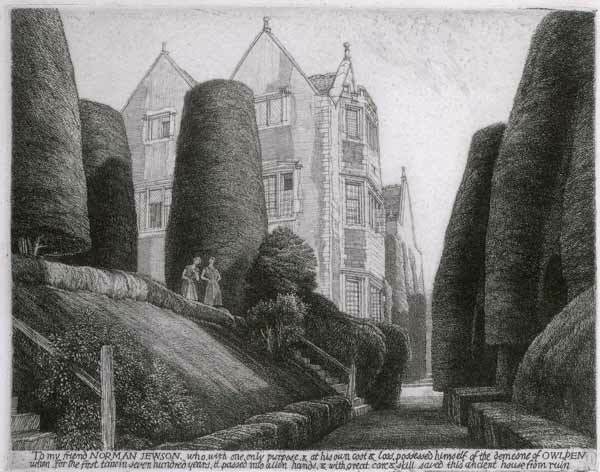 The front (south) elevation is asymmetrical; haphazard, yet "illogically satisfactory" in its appeal (James Lees-Milne). The three gabled bays of the house contrast in architectural proportion, detail and period, yet they balance and complement one another happily, with what Jewson called "good manners", none asserting its distinctive features over the others. They show the tenacity of the Cotswold vernacular building idiom throughout the centuries of the sub-medieval period. 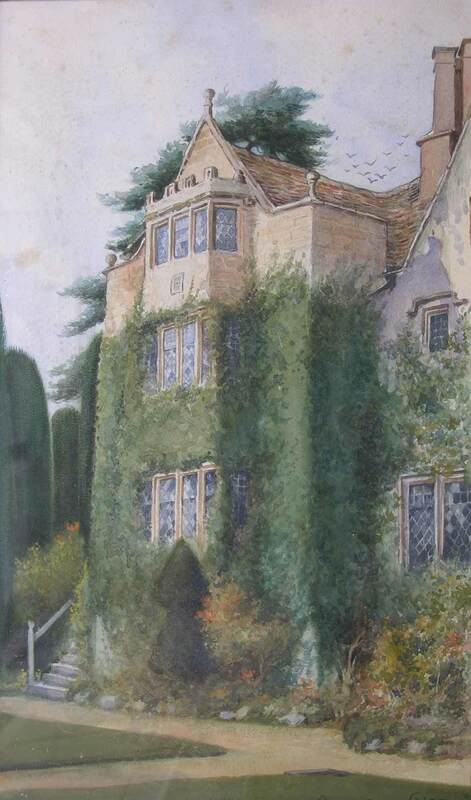 Today the house is not a show place or museum, but the home of Sir Nicholas and Lady Mander and their family. Every inch of it is lived in and most of it is shown to visitors; tours are by arrangement with the Estate Office.